It’s an exciting time when your baby starts walking and officially becomes a toddler — but being more mobile also opens your child up to a whole new world of dangers in your home. Taking the time to search your house for potential hazards could save your toddler’s life. One of the easiest ways to find risks is to look at your home from your child’s point of view. Here are some other common potential hazards. 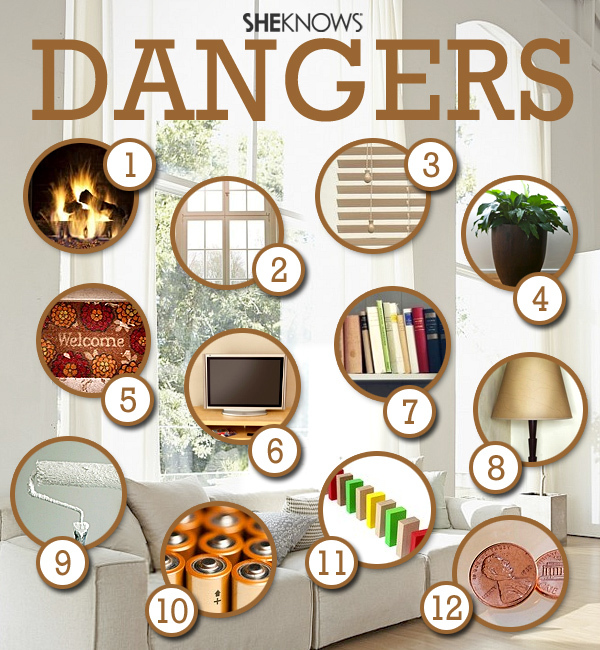 There are so many hazards surrounding that cozy fireplace. Blazing fire aside, the sharp, hard edges of the stone or wood hearth are just waiting to trip up your carefree toddler. Consider adding a soft border to prevent injuries, such as the Fireplace Guard by Prince Lionheart, to absorb the impact of any falls your child may incur. Houseplants are great for indoor air quality, but some pose a threat to children. Becker purchased straps that attach to the back of the TV and the TV stand. “He could still possibly slide the bottom out, but then it falls backwards and not on top of his head,” Becker said. If possible, attach a flat-screen model to the wall instead. While you’re out there buying straps for your TV, be sure to pick up some anchors for your bookcases. A bookshelf is like an indoor ladder to a child — especially if there are enticing items on the upper shelves. Sadly, climbing toddlers have been crushed to death by falling furniture. Place your heaviest books and items on the bottom shelves and securely attach the unit to the wall. Many homes built before 1978 contain lead paint that can poison a child. Highly toxic lead dust is released from deteriorating paint on walls or windowsills. There are batteries in toys, remote controls and a wide array of items that are lying around your family room. Little nimble fingers can manipulate batteries right from their source. Perhaps your older children have small toys or toys with small parts. It’s so important to find a way to corral these little dangers before your toddler gets his hands on them. “Any toy that is smaller than 1-3/4 inches should be considered a choking hazard for toddlers,” says Eland. The living room is where we gather, craft, watch TV, unwind — it’s no wonder that so many everyday things accumulate there. Eland encourages parents to be on the constant lookout for problematic items such as pen caps, soda bottle caps, safety pins, jewelry, magnets and coins. Make sure all child safety products are properly and carefully installed and well maintained. Originally published February 2014. Updated March 2017.